Do you get fed up of hearing the same old story that you can make loads of money on the internet? But every time you try a new scheme or system it just doesn’t hold true? You know, I am realizing more and more that the missing piece to making money online is all to do with what people believe. “What’s the quickest way to start making money online? Nothing about building a business. Nothing about having a job. Nothing about having a career. Let me tell you a story about John and Tim. By the way, these are not real people but the story could certainly be true. I am sure you will relate to it and perhaps even know people who might play the role of John or Tim! John is making money online selling a few affiliate products. He works most evenings when he has the time and some months he makes good money while others he doesn’t do so well. He would like to give up his main job and just make money online but he knows that he can’t rely on what he makes from the internet long term. Tim works full time at home and has an online information business. He started about a year ago but it wasn’t until recently that he was able to give up his day job and work at home full time. He has worked really hard to get where he is and produces all his own training programs and now coaches some clients. If you asked Tim what he did for a living what would his answer be? He would probably tell you that he is self employed and runs an online business. If you asked John what he did for a living he would probably mention his day time job and add that he wants to make money online but doesn’t think he will be able to earn enough to give up his other job. Do you see the difference? Tim is building a business whereas John is just making money online. So who did you relate to the most? John or Tim? What kind of an online venture do you actually have at this moment in time? Who would you like to relate to the most? Whose business would you like yours to be like? You see, unless you have the right mindset and decide to build an online business just like the offline companies do then can you honestly say that you are running a business? Having a business online means that there is a lot more competition than offline. For example, suppose you opened a craft shop in your local high street. If you were the only craft shop there then you wouldn’t have much competition would you? Now let’s take that and put it online so that you have an online business selling craft products and information. Suddenly you have loads of competition! All the other craft websites will be competing for the same target market. Now, you might be able to take on a slightly different angle and target a more specific group of people but your competition is a lot more visible online. By Marketing On The Internet Like The Real Businesses Do! But most of the internet marketing training out there is wishy washy and not aimed at those who want to build a real business. You see, unless you brand yourself, unless you have a clear understanding of what your business stands for, your values and beliefs, then you are just playing at it. 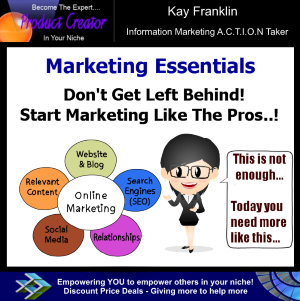 If you are serious about making your online venture work and making the effort to build a business that can compete in today’s market then you need my “Marketing Essentials” training. I did think about calling it advanced marketing because that is what my training program is but at the end of the day I believe that it is essential learning if you are going to be able to market yourself effectively on the internet. 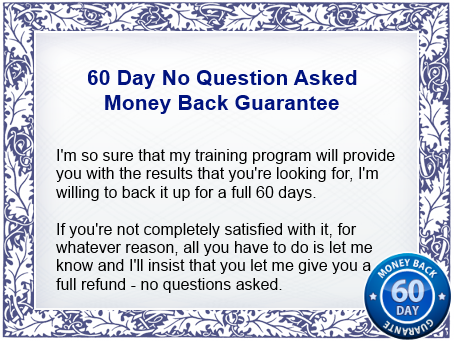 I have implemented what I teach with my own online business and have seen my results dramatically increase. More subscribers, more sales, more trust. But more than that, I now feel much more proud of my business. I’m building my own brand. How would you feel if you had your own brand? You see, there are so many people out there just playing at making money online that if you implement what I teach, you will automatically jump ahead of the majority and be in a position to compete with the top marketers in your niche! So I’ve created this training program so that you can learn from me just how you can do the same with your online business. Step by step easy instructions for building your own business brand and being able to stand out against your competition by marketing the right way. Let me ask you…how would it FEEL to be able to tell your friends and family that you have a real business brand! Your very own! Imagine how confident and proud you would feel! And of course how would that impact your sales and online reputation if in just a few months you had an established online presence spreading your own brand message? It This What You Dream Of Having? Don’t leave it as a dream, let it become a reality by going through my training program and implementing all the steps I teach you. I will literally take you by the hand, and give you, step by step, my exact formula for building a branded business so that you can market just like the pros. So what will I be teaching you? All you need to stand out and become a real threat to your competitors. Perhaps you’re thinking – it sounds great but won’t it be the same as all the other training about internet marketing? I can understand why you might be sceptical but let me state that this training is based on offline business models. I have done the hard work for you in that I have related everything to the internet marketing world. So you will be learning how real offline business go about branding and marketing effectively and how you can use those techniques in your online business. 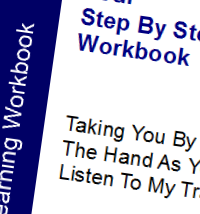 As you go through the training I have added crucial steps that you need to understand and complete and you will see these box sections throughout your workbook. 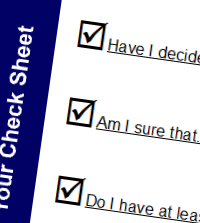 Answer these questions and easily create your own plan of action. This workbook will really empower you to move forwards faster, to start building a professional online business. Every task is broken down into simple steps and you will see at a glance what you need to do or work on. 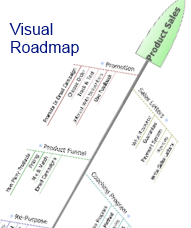 It makes building your own marketing campaign a really easy process! You’ll experience a huge sense of accomplishment and confidence as you finish one simple step and proceed onto the next one. And every tick represents another step closer to your ultimate goal of building your own branded business! So, are you ready to take that leap and become a real professional online? The reason is that every day you put off building a real brand and learning how to market professionally – you are just playing at making money. You see, if you had a branded website, a brand message, a solid reputation, your own set of brand values, your own marketing message, your own unique selling point in place right now – you would be making a whole lot more money online, wouldn’t you? I want you to start building a real business for yourself quickly and you can by following my marketing essentials training. So what’s my price for this entire package – a complete branding and marketing system with step by step instructions and valuable resources for creating a professional online marketing campaign? The truth is, either you know that this can revolutionize your business and turn it into something that will provide you with a full time sustainable income…or you don’t. P.S. If you want to get ahead and start marketing like the pros then you need my training program. Don’t be fooled by the claims that you can follow the old internet marketing strategies – they don’t work like they used to. You need to differentiate yourself to see success.